“We believe our power is in our people and we continually invest in our most valuable asset - people.” - Dave Bonnstetter, co-founder and president of TTI Success Insights. 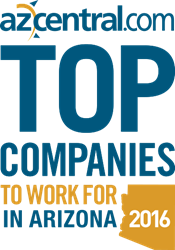 TTI Success Insights (TTI SI), a global leader in self-discovery and research-based assessments, has earned a spot on the list of 2016 azcentral.com® Top Companies to Work for in Arizona. TTI SI was recognized in the small business category and was also acknowledged as one of the top three businesses with a culture favorable to women. The 100 “Top Companies" were honored at an awards breakfast reception on June 7, 2016, at the Hyatt Regency Phoenix and were published in a special supplement in the June 12, 2016 issue of The Arizona Republic, as well as online at topcompanies.azcentral.com and http://www.BestCompaniesAZ.com. For complete details, visit http://www.ttisi.com or topcompanies.azcentral.com.